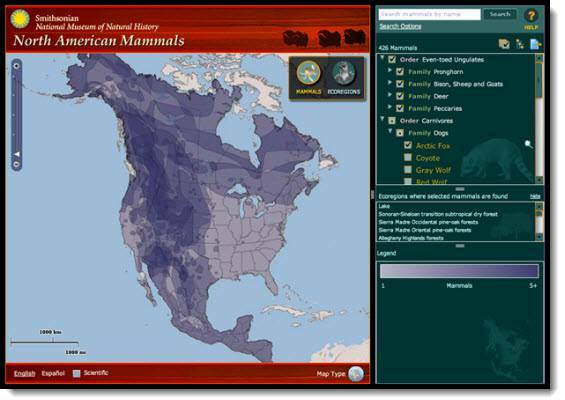 Smithsonian National Museum of Natural History has asked Blue Raster to recreate its interactive searching tool for North American Mammals. Migrating from the legacy ArcIMS application to ESRI ArcGIS Server and Flex API with a custom-based map, this web site has been designed to serve as a comprehensive resource for students, teachers, and the general public and will make accessible the Museum’s unparalleled natural history collections, scientific research, permanent and special exhibits, and libraries. With detailed descriptions, images, and distribution ranges for more than 400 mammals native to the North American continent, this new application allows users to examine the distribution of mammals over the continent through complex and customized searches of animals, locations, and conservation statuses. The map provides a variety of filters to refine a user’s search, including topography. Users can also create a Field Guide from their search to take into the outdoors. For more information regarding the Smithsonian National Museum of Natural History launch-please visit North American Mammals.